Washington State, meet with Irene Dunne prior to the 1931 Rose Bowl. 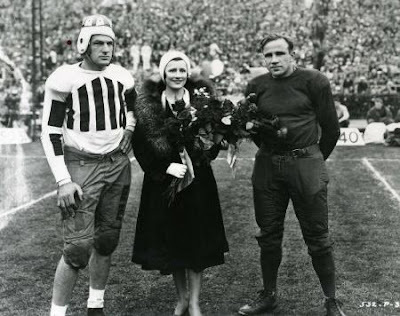 The 1931 Washington State team that contended against Alabama in the 1931 Rose Bowl was represented on the sideline by a promising young Hollywood actress, Irene Dunne. A native of Kentucky, Dunne began her career in the 1920s on Broadway and her big break came in the starring role of Jerome Kern and Oscar Hammerstein II's musical Show Boat. 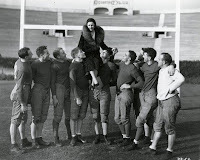 She was "discovered" during a Chicago performance in 1929 and signed a contract with RKO and starred in her first movie the following year (Leathernecking). Dunne and the Wash. State team. Dunne was tapped as a sponsor for the Washington State Cougars as part of a publicity push for the young starlet. She posed for photographs with the team captains before the game at midfield and addressed the Cougar squad before the kickoff. 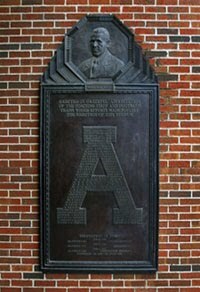 Although the stadium had been expanded to a new-capacity crowd of more than 84,500, inclement weather was blamed for a disappointing turnout of 65,000 for the game. In a 1990 interview with the Spokane, Washington Spokesman-Review, Washington State tailback Tuffy Ellingsen recalled the team's encounter with Dunne. "Before the game she came out and met in our huddle," he said. "Irene had a little speech. She said, 'We want good sportsmanship. We want good relations between the teams.' One of our guys said, 'We'd rather have good relations with you, Irene.'" Washington State lost to the Crimson Tide 24-0. 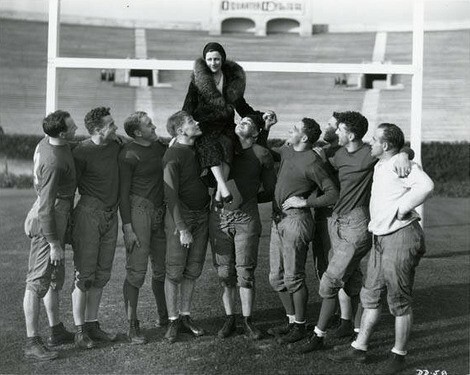 Dunne's performance in Cimarron later that year earned her a nomination for the Academy Award for Best actress (she would go on to earn a total of five nominations but never won). She would go on to become a very popular screen heroine during the 1930s and 1940s starring in films such as Back Street (1932), Theodora Goes Wild (1936) and The Awful Truth (1937).